Continuing on with my internet story is something I will be doing right after I get you up-to-date with current events, although there has not been much going on. Although the Super Bowl was last week, the new Alliance of American Football League (AAFL) started this week. There are only 8 teams and they only have a 10 week season, but that fills in at least those 10 weeks with football. Also, two weeks after the final AAFL game, is the NFL draft. So we have American football until the end of April anyway. I’ve determined that, since there is only 1 Texas team in the AAFL, the San Antonio Commanders, then they will be my favorite team. San Antonio is also my favorite large city in the world, so it works out. Go Commanders. I was also able to go to another party since last week. It was at one of my Filipino nephew’s house. The house is actually not even finished being built yet, but they decided to have a bbq there anyway. Me being the picky eater, they bought me some Chooks to Go roasted chicken along with several bottles of San Miguel. I also had 3 small baked potatoes with that chicken. I have also written lyrics for 2 more songs, but I still do not have anyone that can write the music for me. Maybe someone reading this knows someone that knows how and would like to take a chance on splitting any potential money with a rookie songwriter. I’ll work on the lyrics to see if they can be improved on while I wait. Time to continue with my internet experience. If you remember from the last post, they still had not shown up even after promising they would. 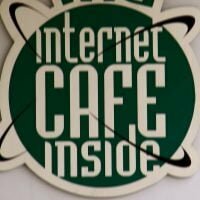 So I could update my fantasy football teams and check my e-mail, I had to go to the internet cafe. Luckily it’s like a 5-second walk from the front of our house. Since I have all my passwords saved, I was worried if I was going to remember them all. I did not remember all the passwords. I had to go the “Forgot Password” route, but I finally got in. There was nothing much in my e-mail and all my stateside fantasy teams lost. Not a good week. For my 2 teams I have with someone here though, I did well. Since there is no internet, I just updated my music files on my thumb drive. At the time I was up to 1088 songs on my 16gb drive. Now it is up to 1973. I don’t know how many songs I can put on this drive, but my goal is at least 3000. If there are a little more, that’s okay too. I’ve got all kinds of stuff on there, from The Andrews Sisters and The Partridge Family to Black Sabbath and Pink Floyd. The day is not over and I’m still hoping that Globe actually does show up tomorrow before noon to fix the problem once and for all, like they said they would, for sure this time. If they do not, I will be down at the local Globe office making a little stink. I’m sure they are not happy when I show up there and they know I’m having a problem. The next post will be the last one regarding my internet problem. Obviously, it got resolved but I want to go through with it all until the end. I still have one side of a notebook page of old notes that I will finish up on the next post. Yes you are, but you are way up there on Luzon. I live in Calbayog City on Samar. I hope you are enjoying your time in the PI. Thanks for visiting my blog. I hope it is somehow helpful for you. If it is, please tell others. If not, please tell me why.